Maharashtra – The Industrial hub of India of also rich in history. With its ancient caves, temples and sculpture treasures spread all over the State and its surrounding Sahyadri mountain range, Mumbai is truly a fantastic union of the old and the new! Mumbai is one of most unique cities in the world. Its ancient caves – with stunning sculptures and iconic carved wall panels spread around in the Sahyadri Mountains that ring the city; its urban development done by joining seven little islands in the sea; its stunning growth as India’s greatest business centre; its twinkling night life; its scintillating business growth and its incredible architectural masterpieces from the pre-historic cave residences and temples to Revival Gothic masterpieces built by the British in what is called the Fort Precinct – all are wonders of the modern world. It is one of the highest populated cities in the world. Mumbai is the business capital of India and also the capital of the state of Maharashtra, a state that has led India’s social change and economic progress like no other state has in the history of India…Here, we describe the cave temples and stone carved buildings and sculptures from prehistoric times that make Mumbai one of the oldest cities of the world with a fabulous art treasure! Now, in a new highly-researched book written by Prof. M K Dhavalikar, this unique city’s personality has been researched and documented under the title: The Goddess of the Western Sea – The Cultural Heritage of Mumbai. The book was recently released by famous archeologist Arvind Jamkhedkar at a glittering function in the Chhatrapati Shivaji Maharaj Vastu Sangrahalaya. The book portrays Mumbai as a magic city where the old and the new meet and merge seamlessly in a unique and sparkling fabric of people and places. The book inspires all Indians interested in unraveling the rich past of India by providing a glimpse into the magic building of one of the world’s greatest metropolises. The book tells the history of Mumbai and the fairytale story of its spectacular growth. The colonial British rulers realized the potential of the city as an international port and industrial centre. There is evidence that human communities lived in these islands long before the Common Era. That the fishing community of Kolis lived here first has been disproved by this book stating that the Mauryan dynasty first gained control of the islands during the 3rd century BCE. Powerful kings – such as Chandragupta Maurya – brought Hinduism and Buddhism to these islands. They made the islands a centre of Hindu and Buddhist culture. Later, others like the Satavahanas, Chalukyas and Rashtrakutas etc. took control of the islands and continued their architectural activities. Importantly, the Shilaharas ruled the islands from 810 to 1260 CE and built wonderful monuments. In the latter half of the 13th century, an enterprising ruler named Bhimdev ruled this region and created settlements of his own people. However, the Sultan of Gujarat captured the islands and later, in the Treaty of Bassein, surrendered the islands to the Portuguese in 1534. The Portuguese king gave them as dowry to the British king when he married the Portuguese king’ daughter. It goes to the credit of the British, that they filled the sea around the seven islands in one of the biggest land-claiming operations ever and joined the seven islands to make one city called Mumbai. It was named after the Goddess Mumbadevi who was the goddess of the biggest among the islands namely Mumbai. The temple stands in its original place even today. The British later changed the name to Bombay. It was changed to Mumbai in 1996. Due to its position on the Arabian Sea, the city developed as an important business and trade centre and educational hub. By 1853, the first railway began plying from Mumbai to Thane. The island city became a very powerful base for India’s Independence Movement with Lokmanya Tilak declaring: ‘Freedom and Self Rule is Our Birth Right’. 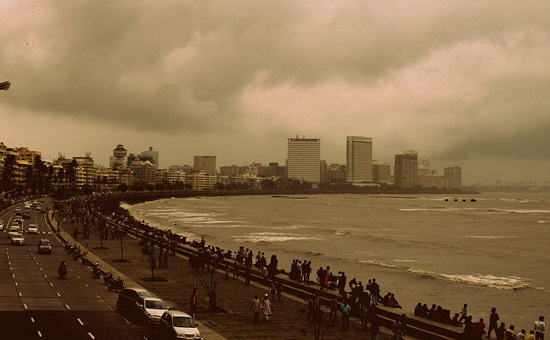 Post independence Mumbai became the most important business and trade capital centre. 1960 saw the formation of the Samyukta Maharashtra. With this, a huge number of ancient monuments, art objects, inscriptions, sculptures cave temples and even water tanks came to be a part of Maharashtra. Right from Mumbai to its widespread hinterland, ancient sites were discovered showing that the area was rich in art, commerce, religion, knowledge of construction, rock carvings and making of sculptures. Apart from manufacturing and textiles Mumbai hosted Bollywood. Dadasaheb Phalke made the first film called Raja Harishchandra with financial help from Raja Ravi Varma, the artist whose paintings are world famous. Shri Varma and his partner Anant Shivaji Desai Topiwale sold his lithograph-making press and the land it stood on in Malavali and gave the money for the film. In a way the women’s movement for equal status also started in Maharashtra with Dhondo Keshav Karve opening schools and colleges especially for women. The SNDT University is still a prominent feature of this movement. Dr Rakhmabai, the first woman doctor of India, also became a huge case against child marriages as she chose to not accept the marriage and went for education to become the first woman doctor. She fought in court not to use the father’s or husband’s name while signing her own name. Her portrait hangs in the Mumbai University entrance hall to this day. Dr. Rakhmabai is an ideal for all professional women even today. Laws about marriage, property and other changes which concern women’s status in society and in law and finance found supporters first in Maharashtra. This is a state which has not only contributed greatly to the political and social life of India, but also preserved the past with its glorious, historic cave temples, frescoes, sculptures and inscriptions. Following is a list of some prominent temples and caves, sculptures and carvings which have made Maharashtra rich and famous for its historic treasure. It must be noted that the list is neither complete nor exhaustive. 1. Kanheri Caves Mumbai: It is evident from the inscriptions that monks, scholars and experts of those times created the sculptures and inscriptions in these caves, around the 3rd century before the CE. Today, these caves are part of the Sanjay Gandhi National Park. 2. Shurparaka: The trading port Shurparaka, now called Nala Sopara, became a huge trading centre during the first century BCE. It had trade ties with Rome and other famous cities of the west. Many traders at that time called Mumbai Heptanesia or a cluster of seven islands. Today, Nala Sopara only has a stupa in a newly resurrected condition and is the only monument that represents the old Shurparaka. 3. Jogeshwari caves were created in the 6th century: In the early years of Independence, these caves were famous because a sadhu/sanyasi who lived there with his pet tiger! 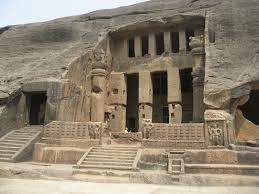 The Jogeshwari Caves; say experts, could be the earliest Hindu and Buddhist caves with sculptures of deities. They are within the city limits of Mumbai and are considered to be some of the earliest Hindu and Buddhist cave temples and sculptures dating back to 520 to 550 CE. 4. Banganga Tank and the Walkeshwar Shiva Temple: History credits the kings of the Shilahara dynasty for building this ornate temple and the impressive, massive stone steps leading to the tank. It was built in the 10th century. 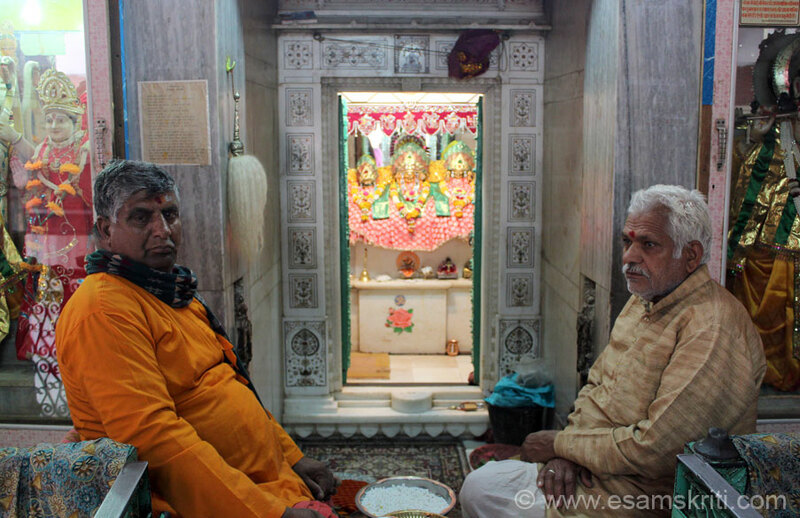 When you walk around the small lanes that surround the tank you will feel you are in Kashi. Additionally, in the epic Ramayan, there is a story that during their exile Ram, Sita and Lakshman came to this hillock near the sea. When Sita wanted fresh water to drink, they could not find any. Therefore, Ram shot an arrow into the parched seaside ground and brought a spring of fresh water for her. 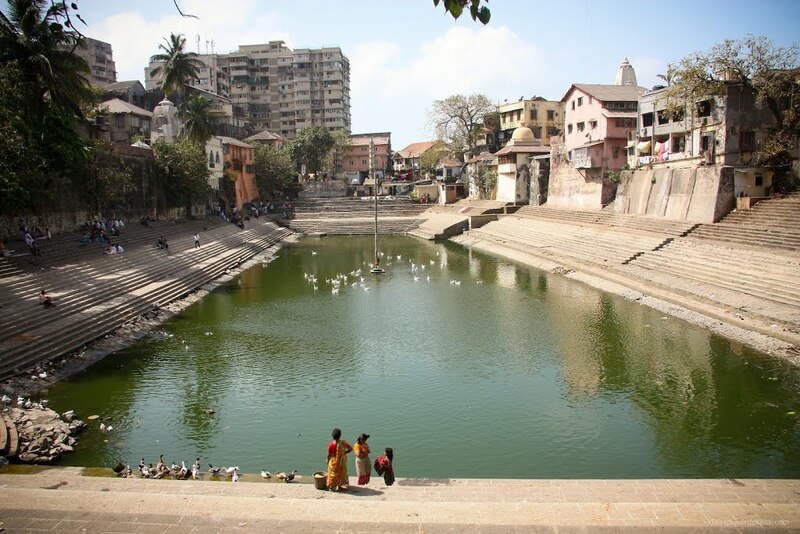 This is why the reservoir is called the Banganga, meaning Ganga brought to the earth by shooting an arrow in the ground. It is amazing that this source of sweet water is situated near the ocean and even today has no salty taste to it. King Bhimdev later built his capital in Mahikavati, now Mahim, and in the 13th century built the Babulnath Shiva Temple. It is said that the king also planted large coconut plantations on the coastal strip. 5. The Karla Caves: They stand on the old Mumbai-Pune highway near the railway station of Malavali. They are a wonder of human effort as the massive hall with 32 carved pillars – 18 on each side of the hall – of gigantic size have been made to lead a wide path to the Chaitya. The hand-carved pillars are perfect in design and unique in their size and perfect similarity. 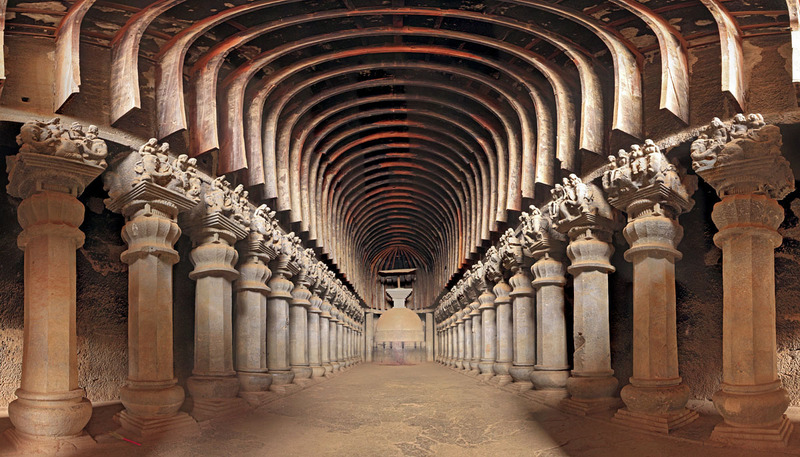 This hall is reputed to be largest cave-turned hall in India. Outside, at the entrance of the cave, stands a huge Ashoka pillar which is seen on India’s currency notes and several government documents. The Karla Caves are Buddhist and are the largest single hall carved out of a rock with the pillars. The wonder in its creation is that even in this early age, the men who made this care temple know about the quality of the rock because a faulty rock, according to architectural science and religious tenets, cannot be used for a temple. Alongside, in other rocks, there are simple cave residences for the monks or other workmen. The round area is a plateau in the Sahyadri Range of Mountains. All these were created between the 2nd to the 5th centuries BCE, with the oldest cave being made in 160 BC. The Karla residences were home to many traders who travelled down the west coast for their work. The Sahyadri Range, running down the full length of Maharashtra, is made of the Deccan Trap rocks and is faultless in formation. The range is a marker line between north and south India and is home to flower valleys, ancient buildings and sculptures. The coastline has been a valuable trade route for centuries. 6. Bhaja Caves: On the other side of Malavali rail station, are a group of 22 caves dating back to the 2nd century BCE. Bhaja too, was an important trading hiatus, probably set in the centre of south and north India. The caves have some stupas and inscriptions. 7. 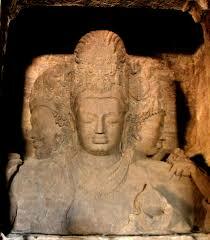 Elephanta Caves: Off the coast of Mumbai, stands the Elephanta Island. Here the caves are sculpted in the most astounding manner. The Trimurti as well as the sculptures of Shiva in various poses are superb and well preserved in spite of Portuguese soldiers making some sculptures their targets in shooting games. The sketches of such destructive activities have been collected by Mumbai’s historians and can be seen on the net too. They comprise a big group of Hindu caves and a smaller group of Buddhist caves. The wonder of the Hindu caves is the Trimurti, carved out of a single rock, and complete with jewellery and gorgeous vestiges. These represent the Brahma, Vishnu and Shiva. The sculptures around show Shiva in various episodes of the ancient texts such as the Shiv Purana. The marriage of Shiva and Parvati; Shiva as a cosmic dancer and other incarnations of Shiva. The style in which the caves are created indicate that they belong to the 5th to 10th centuries CE but there are no records to prove who could have built them. It is said that long ago, the sculptures were painted but today, only traces of paint remain among the sculptures. The Elephanta Island cave temples are a unique heritage by any standards. The rock used for the caves shows the incredible geological knowledge which the early builders had about the quality of rock needed for such a gigantic effort. The cave with the Trimurti was renovated in the 1970s and was named as a UNESCO World Heritage Site in 1987 to ensure that Archeological Survey can look after the monument perfectly. The sculptures show artists playing musical instruments like the Tabla or Veena which are played in even today only goes to prove they were also used thousands of years ago. The dance sculptures also remind us of modern classical dance styles which prevail in the present age, even after 2000 years! 8. Ajanta Caves: More explorations in the Sahyadri Mountains take us to the 2nd century BCE to 650 BCE caves of Ajanta in Aurangabad District. The exquisite caves include frescoes and sculptures which are considered the surviving examples of ancient Indian art, especially the paintings which show form, pose and attitude. These are renowned as masterpieces of Buddhist art. The caves are seen in two parts; the first starting with the 2nd century CE according to UN art experts. Further, experts say that the second part was built between 460 to 480 CE according to scholars. This unique site is now a UNESCO Heritage site and is maintained perfectly. Counted among the structures are monasteries and places of worship of Buddhist paths. 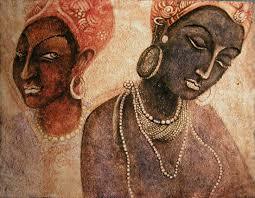 The chief features of the Ajanta Caves are the wall paintings which are seen in large number in these caves. Many Chinese and Eastern Buddhist travelers who came to India for trade have left the descriptions of their visits to these caves. It is astounding that the caves lay under a jungle landscape until accidently discovered and brought to the notice of Western nations when a British tiger hunter discovered them in 1819 CE. Today, they are a national heritage. 9. 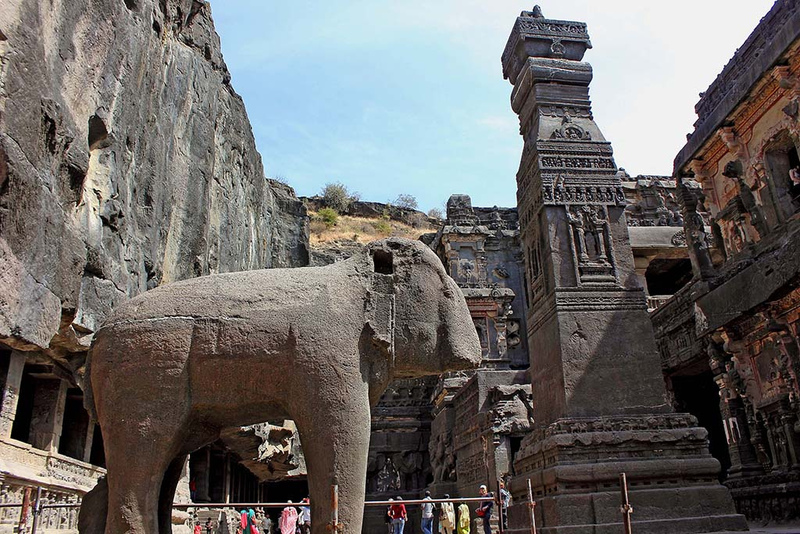 Ellora Caves: These are undoubtedly a marvel of human effort. It has rightfully been included in the list of UNESCO World Heritage Sites. The caves have monuments and sculptures of all the three regions which originated in India – Hinduism, Buddhism and Jainism. In this group, Cave 16 is truly a marvel. It represents the largest single monolithic rock-excavated temple out one huge stone from the top to the bottom. the one and only such perfect architectural creation in the world. Called the Kailas temple, it is dedicated to Shiva and has a chariot-like shape. In addition, the temple excavations have produced sculptures of various deities worshipped by Hindus. There are also wall panels telling the story of India’s two epics namely Ramayan and Mahabharat. Of the 100 caves, 34 are open to viewers and the Kailas temple is the most visited monument. Western scholars and archeologists have been so stunned by the perfection of the Kailas temple that they have opined that this temple and its creation in its present design is inexplicable and even wagered a guess that it could have been built by experts from some other planet. Carved from the top, the temple is perfect in concept and carving. It is a rare masterpiece, unequalled anywhere in the world. To begin carving at the Shikhara and work down to create the pillars and walls, and then the foundation and interior is a unique feat in the entire world and shows the knowledge the builders had long ago! 10 Shiva Temple Ambernath: Dr Kumud Kanitkar has done extensive research on this temple. It lay unknown and covered with debris and wild plants for decades after Independence came to India. Dr. Kanitkar has published a book on her research as a scholarship winner of the Asiatic Library. 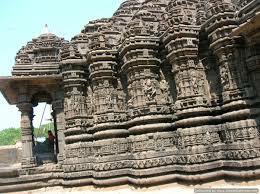 Built almost a thousand years ago, temple is near Ambernath rail station. It is on the banks of the Waldhuni River and designed in the Hemadpanthi style. Research says that the Shilahara king Chhittaraja built it and his son Mummuni completed it. A unique feature of the temple is that visitors have to go down 20 steps to go to the temple’s sanctum sanctorum where a Shivalinga is consecrated. The temple also has unique carvings of deities on its outer surfaces and within the temple. 11. Parel Shiva: When a sculpture was discovered during a road repair program in Pare in Central Mumbai, this discovered Shiva icon surprised every Mumbai resident. The Shiva sculpture has been declared a grade-one heritage monument protected by the Archeological Survey of India. It is truly a marvel in concept and execution. Near where the sculpture was found, there are more temples – of Chandika, Vyagreshwari and Shiva. Some of the sculptures date back to 600 CE. When the government agencies tried to move this unique find to a museum, the local residents objected and wanted the sculpture set up in their own home area. Now set in a room measuring 15 ft by 10 ft - is known as by the name Baradevi, a name given by locals. 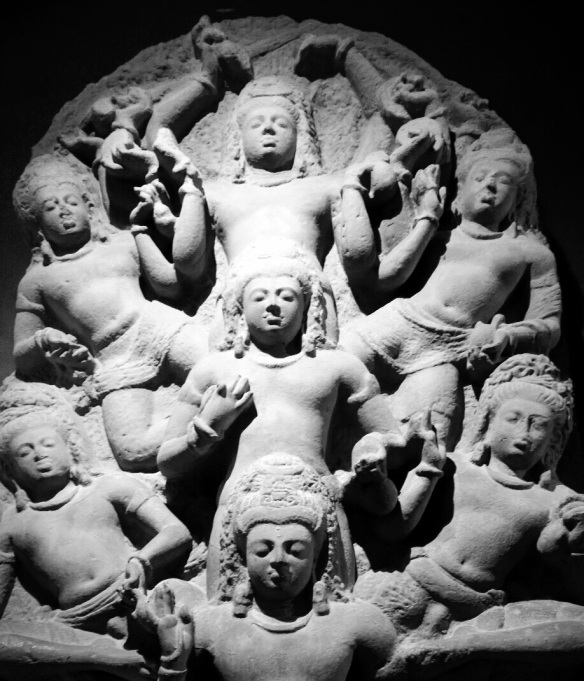 Amazingly, the relief sculpture of Shiva with seven heads was found during road construction, among chipped stone pieces, showing that it was not completed and thus, not consecrated. The sculpture has matted hair and thus is called Parel Shiva. There are two figures each from his shoulders as also his head. Also, two figures kneel at the base and these have unfinished heads above them. Historians aver that the 11.5 ft by 6.5 ft sculpture perhaps made to be installed in a cave as it seemed too big for a temple. Since it has been damaged during excavation, it is not used for a temple or worship. 12. The Kaas Plateau: A valley situated near Satara it is an ornament of the Sahyadri Mountains which are often called the Western Ghats. After this ‘Valley of Flowers’ and some rare plants was discovered, it was named a UNESCO World Natural Heritage in 2012. It is one of India’s biodiversity ‘gem’ and is visited by thousands of tourists to see the huge variety of seasonal wild flowers among which a variety of butterflies make their homes. 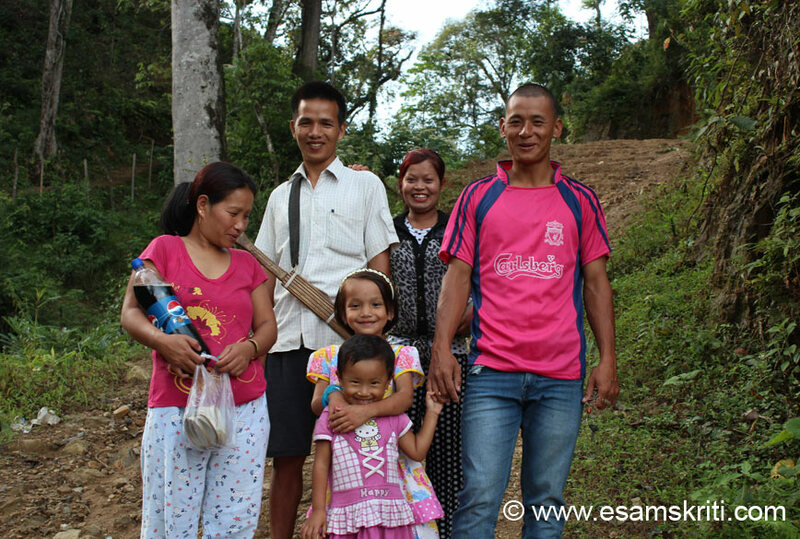 This ‘sanctuary’ stands at an altitude of 1200 metres and spreads for 10 sq km, People are allowed into the valley with instructions not to disturb the butterflies and be careful in the huge fields of glistening flowers with dewdrops. Did you know? Why do the Sahyadris have such a large number of cave temples, stone carvings, sculptures and forts – AND even modern train tunnels in the present age? Thousands of years ago, India’s various communities knew that the Sahyadris were a special mountain range made of a rock called the Deccan Trap and Basalt Rock. This means that the rock was solid and had no cracks or white lines in its body. It would yield figures, carvings and huge caves or columns without a scar or abnormality in the rock. Cracks, joints or white lines are not allowed while creating a temple or cave for deities. This was a rule for all sculptors and builders. Even today one can see efforts made in Elephanta, where half done work has been discarded because of veins in the rock. Thus the Sahyadri Range running down the coast of Maharashtra, Karnataka, Goa and Kerala became a popular destination for Hindus, Jains and Buddhists who wanted to create everlasting monuments and sculptures. Even the British rulers of India knew that here was a range which could yield long and lasting tunnels for trains to pass through so the Mumbai-Pune railway was built with 14 tunnels. The Sahyadri Mountains have been included in the World Heritage Site list in recent years. A cluster of 39 sites spread over the vast ranges of the mountains are of a quality which is found only in the Western Ghats or Sahyadris, These mountains are now named as a UNESCO World Heritage Site which is described as one of the eight "hottest hot-spots" in the world”. There are worldwide efforts currently going on to make the mountains free of intrusions, garbage dumping or any kind of desecration. Maharashtra is a path breaker in many ways. First Shivaji Maharaj led the battle for Swaraj. The state also led the movement for women’s rights to education and financial freedom and banning of child marriages It leads in education, culture and social reform as well as the political climate of India.